New Yorker's love their pizza, and after the city came in fourth behind San Diego, Las Vegas and Boston in a TripAdvisor survey, I decided it was time to add my two cents. 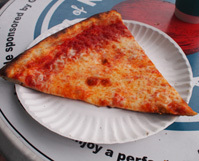 Feel free to disagree with me, but when I think of a true New York slice I think of Joe's on Carmine Street in the Village. It's nothing fancy. In fact, the real draw is in its simplicity. The mozzarella is your standard variety with a tomato sauce that tastes like it spent just a few minutes on the stove. Add in a thin crust and what emerges is a mouthwatering slice that is crispy with a wonderful char loaded with gooey mozzarella. What also makes this slice great is the turnover. Nine-out-of-ten times I've eaten here the slice was fresh right out of the oven. 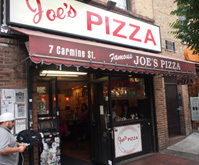 Joe's also makes a sicilian and a fresh mozzarella pie, but it's the regular slice that truly shines.